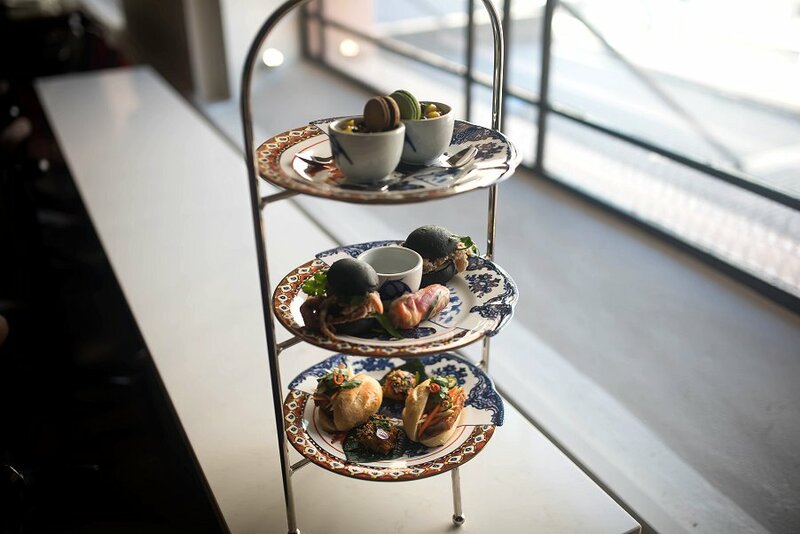 The ever popular afternoon tradition of savouries and sweets piled onto a tower served with tea and perhaps a little booze is becoming increasingly popular in Adelaide with more and more restaurants and hotels offering a high tea. Madame Hanoi offers a twist on the traditional scones and sandwiches with a focus on Vietnamese delicacies in its Hendrick’s High Tea. Starting on the lower tier we commenced with a delicate cube of Grilled Tasmanian Salmon in a hot pepper paste. 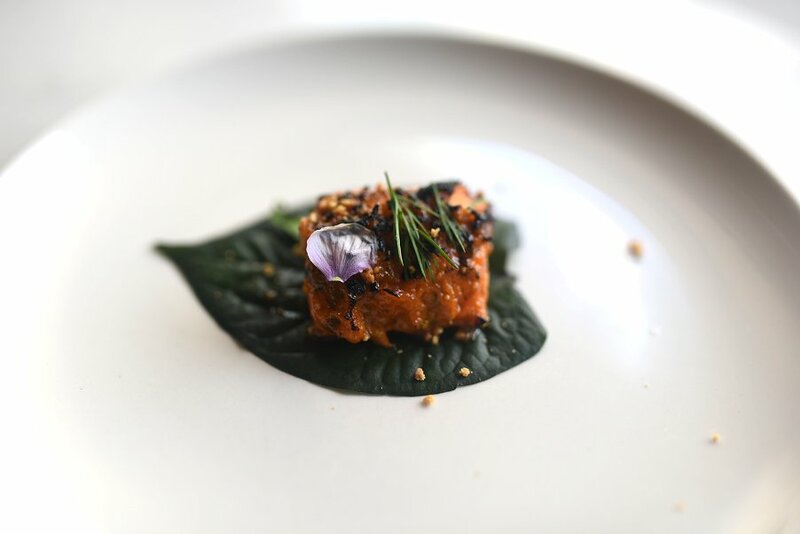 Served on a betel leaf the pepper delivered a rich heat complemented by underlying flavours of lemongrass and ginger. A perfect amuse bouche it awoke the palate and was a perfect starter to this meal. 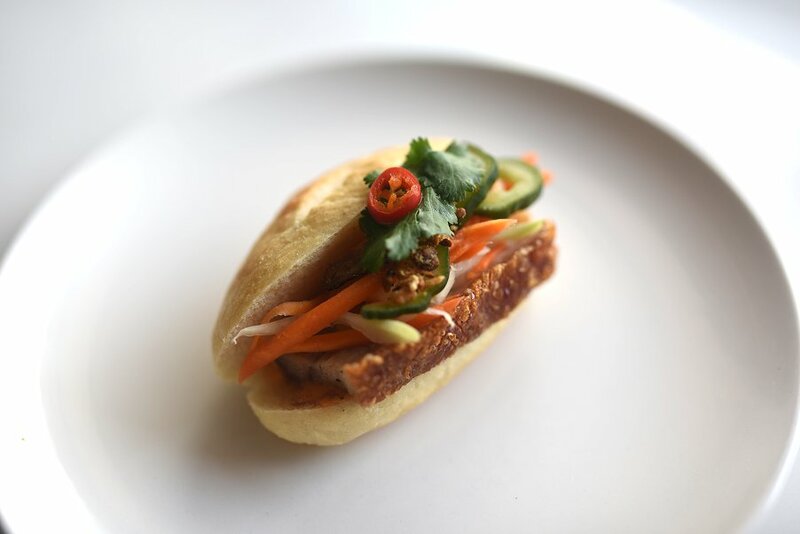 Next up was miniature version of a Crispy Pork Banh Mi or Vietnamese meat roll. These rolls, so popular in Adelaide are a great inclusion in this collection of food. The crusty mini bread roll has a slab of moist roast pork belly, topped with a ribbon of crispy skin. The usual trimmings of carrot, daikon and coriander are all present as well as a smear of pate. 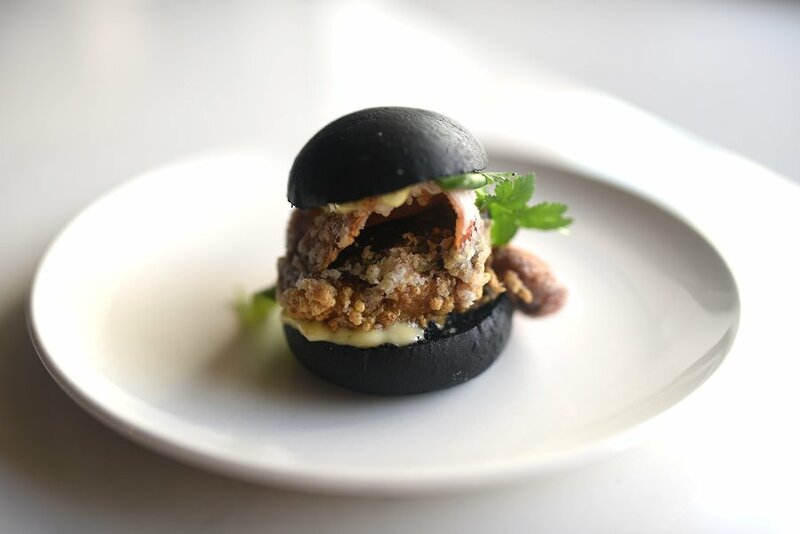 Sitting on the middle tier was a Soft Shell Crab encased in a squid ink brioche bun. Presented like a spider, legs protruding from a round black body. Sprigs of coriander added freshness to the lightly battered sweet crab meat and a chilli lime mayonnaise added the required moisture and tang. To finish the savoury component of the high tea was a quintessential Confit Duck cold roll. Wrapped up in rice paper was shredded vegetables, Hanoi pickle and vermicelli noodles. Sadly, there was not enough of the promised confit duck which would have prevented the delicate flavours from being overpowered by the hoisin dipping sauce. Sweets make up the top tier. 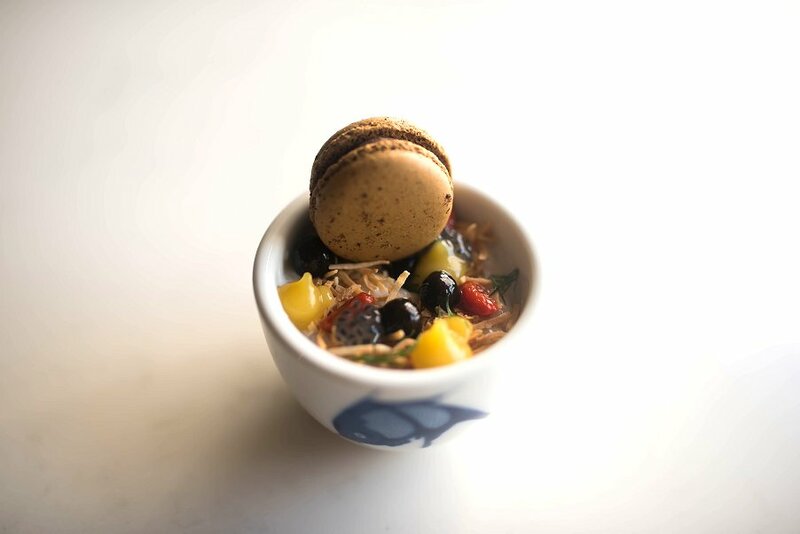 A ramekin filled with Coconut Tapioca is topped with a mini Macaron. The tapioca is paired with mango sago, goji berry and lemongrass and garnished with coconut flakes and dill. A rich coconut flavour gives the tapioca pearls just the right amount of sweetness and the textural components of crunchy flaked coconut and chewy goji berry complete the pudding to make a delectable dessert. The Macaron has a crisp outer shell and a soft centre. Flavours are assorted; mine contained a rich espresso ganache that played beautifully against the Coconut Tapioca pudding. 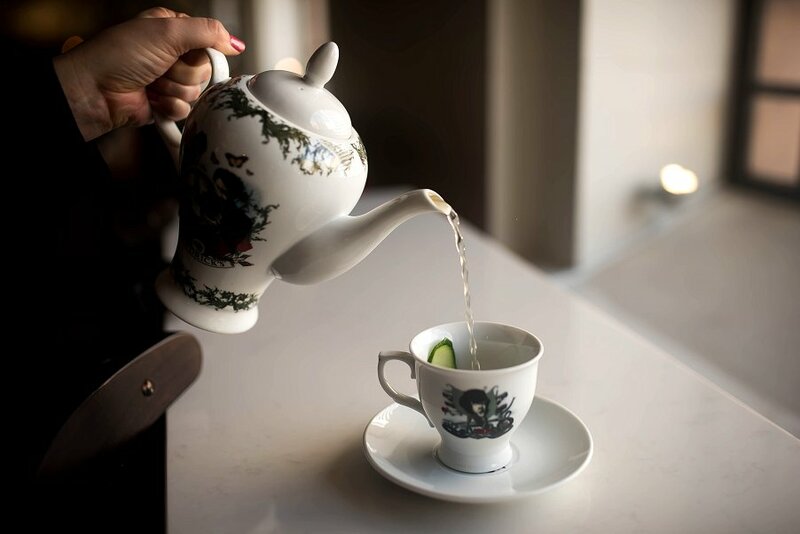 A quirky tea pot and cups containing a slice of cucumber deliver the ‘tea’ part of the high tea. Being called the Hendrick’s High Tea suggests that Gin will be found somewhere, and here it is in the tea! A pot of English Breakfast tea mixed with lime juice, salted and spiced honey and infused with coriander. The tea is served hot and can be had without the gin if you so desire. On first sip the lime juice is an overpowering flavor, but when given time to settle the flavours balance and the tea is refreshing and delicious. The Hendrick’s High Tea is available between 12pm-5pm Monday to Friday and 2pm-5pm on Weekends for $45 per person.